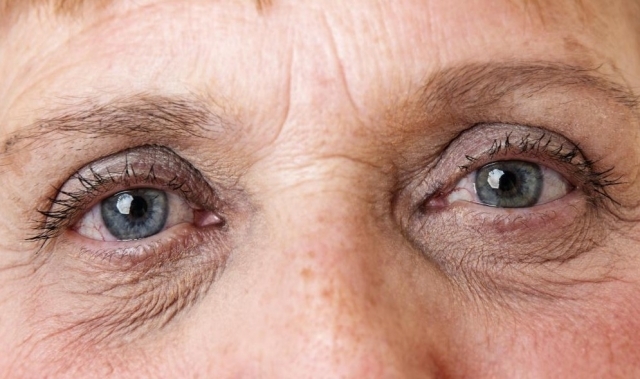 Eye implants are the newest surgical repair for age-related vision loss. It's a gradual experience for most. One day your vision is crystal clear, and eventually, you're pulling your cell phone closer to your face to read text messages. "It's anything with small print. Reading medicine bottles is ridiculous. I can overdose easy!" says Karen Brown, 53, an Uber driver living in Philadelphia. She noticed her eyes were going shortly after her 40th birthday. Now, Brown relies on her "life-saving" reading glasses - one pair at home, and another in her car. Ah, but there may be another lifesaver for Brown and others who deal with presbyopia, a common eye condition among those aged 40 and older. A new eye implant that takes a mere 10 minutes to put in place is the newest in a list of surgical repairs for those struggling with age-related vision loss. Two were FDA-approved about a year ago: the Raindrop and the KAMRA. With both procedures, the implant, which is thinner than a contact lens, slides into a pocket created in the cornea using a laser. Both also go into one eye only - the nondominant eye - while the other eye is purposely left alone for seeing distance. The result is what specialists call "blended vision," says Dr. Leela Raju, ophthalmologist at Bellevue Hospital in New York and a faculty member at NYU Langone Medical Center. And so the new technology isn't for everyone. An ideal candidate should have good distance vision. "We're counting on the brain to use the eyes together to help improve the vision," Raju says, adding that some patients will have a refractive procedure to improve distance vision, and then have the inlay for reading. Some will like it, some may not, which is why it's best to talk to your doctor and ask questions. Raju says the implants work great for short-term reading, and will reduce your need for reading glasses. But they're not so helpful, say, if you're staring at a computer all day for work. A number of conditions can affect how well they work, from lighting to blurred vision caused by high sugar levels. If you already have cataracts or a retina problem, you may not get the best results from the implant, she says. "This is a step toward making it more like the natural eye. It's not a 20/20 fix. Take your time to ask the right questions so you can gauge expectations," Raju says. There are a couple of drawbacks. For example, there's the risk of infection. But the implant can also be removed in those cases, or if you're simply not happy with it. It's also not covered by health insurance and could cost as much as $5,000, according to some reports. If you think it's right for you, talk to your eye doctor and be very specific with the questions you ask. Describe your condition and explain what you hope to gain from the implant. Also, ask your doctor to measure the health of your eyes to see how the implant might affect you in the long term.